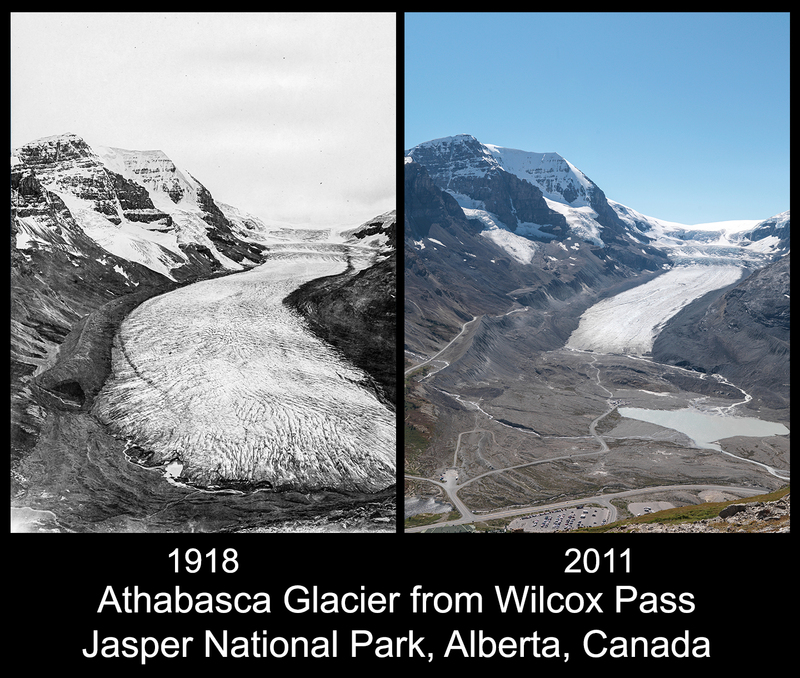 How can mountain study practitioners better explore and analyze image historic / modern image pairs like these? Since 1996, MLP’s interdisciplinary mountain researchers have been in the peaks of western Canada rephotographing historic mountain landscape images. 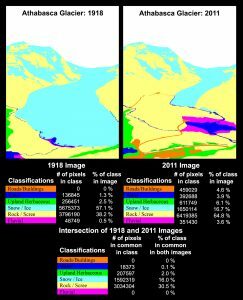 With an ever-deepening collection of historic and modern image pairs available for comparison, MLP researchers asked this burning question: “What tools do mountain study researchers and community practitioners from diverse disciplines need to help them better access, explore, and analyze image pairs? 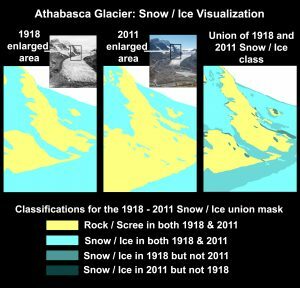 The Image Analysis Toolkit is a big part of our response, and, as more mountain studies practitioners use it, the tool continues to develop. Each image pair in MLP’s Explore website allows access to the IAT with the selected image pair pre-loaded. For example: A.O. Wheeler, 1918, Wilcox Ridge, img 282 and MLP, 2011, img 6171. When at a station with historic and modern image pairs, select either an historic or modern image of interest. Click the “Comparison View” button. The images have been aligned if there is a “wiper” visualization (wipe from historic to modern and back). Click the “Import into the Image Analysis Toolkit” link below the wiper. Images that have not been aligned can still be imported into the IAT. Scroll down the page below the “Pending Alignment” images and click the “Import into the Image Analysis Toolkit“. The latest development version of IAT can be accessed at IAT Beta. It opens with a pre-loaded project to practice on. Check out the online Help File to get started. *IAT has not yet been optimized for use on tablets and mobile devices. IAT works best on Chrome, Firefox, and Safari. Focus on oblique photographs — provide tools for working directly with and on the photos. Make access widely available — allow anyone with an Internet connection and a modern web browser to see, manipulate, compare, and analyze their own mountain photographs and/or use images in the Mountain Legacy collection. Allow anyone to download the toolkit and use it without an Internet connection, thus making it usable in remote field locations. Emphasize comparative visualization — align and show the images side by side as well as overlaid on one another. Allow for targeted, aligned window, polygon, and area views from one image onto the other. Facilitate classification and interpretation — allow practitioners to apply their own expertise when exploring the images. Practitioners should be able to classify and quantify, change, annotate, mark up, and visualize images as required for their various lines of inquiry. An example of a fully classified image pair with percentage of classification cover in each image.The intersection of the two images represents the percentage of each classification that stayed the same between the two images. 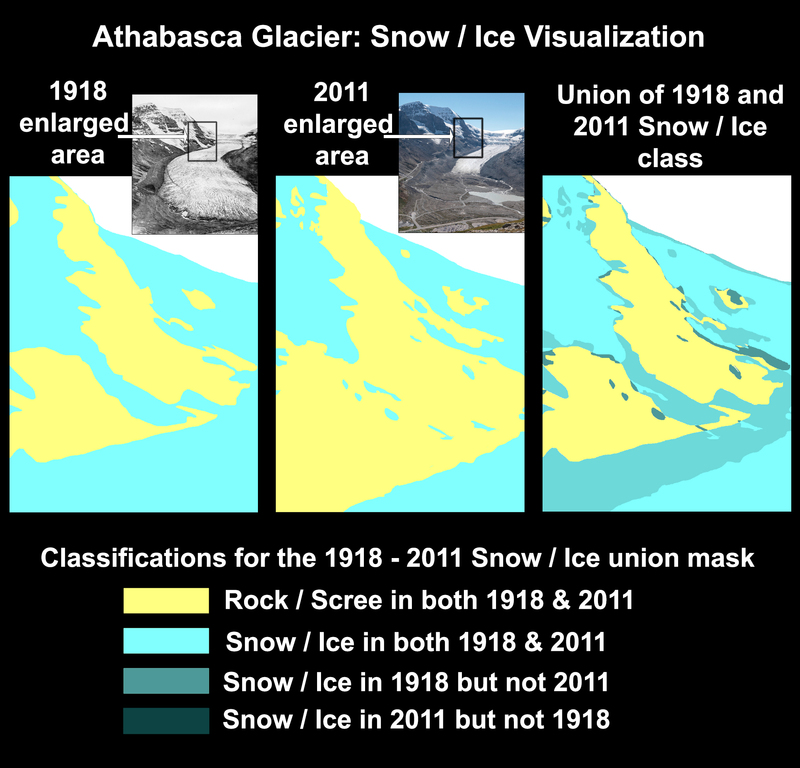 An IAT visualization showing change in snow and ice. The light blue is common to both images. The medium blue is found in the historic image but not in the modern. The dark blue/green is found in the modern image but not in the historic.